The Merax company has hit the market with its own version of the popular racing style game chair. They understand the gamer crowd’s demand for comfort that lasts through long hours of working, studying, and gaming, all from one chair. And they have created the Merax gaming chair to provide all the functionality you need for staying comfortable. The ergonomic design of this chair will help to keep you in a position that’s optimal for your neck, back, and shoulders, reducing the chance of pain or injury from long periods of sitting. It even has comfortable lumbar and head cushions for extra support. You may not feel like you need an ergonomic chair right now as you don't have any back pain, but don't you want to keep it that way? After years of sitting for hours in front of a computer, whether it's for gaming or work, you're likely to see some ill effects from that if you are sitting on the wrong chair. Using a gaming chair like this one from Merx with its design and adjustable lumbar support pillow, will keep your spine aligned which will improve your circulation. When your blood is flowing, it carries oxygen where it is needed most. Namely, your brain, so you can stay focused and not feel tired. What really stood out to us about the Merax gaming chair is the affordable price tag and body hugging style of the backrest. Because the chair looks fairly impressive at first glance, we were curious what features you get for such a reasonable cost. It may not be as feature loaded as the DXracer gaming chair, but we think you’ll be quite satisfied if you select the Merax racing style office chair and save yourself a bit of cash. It’s apparent from the features that Merax created this chair to be a high-quality racer style gaming chair. The Merax gaming chair’s dimensions are 19.6’’ x 20.1’’ for the seat and 22.6’’ x 33.4’’ for the chair back. The chair weighs 44.1 pounds, which is similar to other chairs of this style. It’s not the lightest chair we’ve checked out at gamingchairs.com, but it’s certainly not the heaviest. It should be easy to bring in after shipping but hold up to the weight of most gamers. 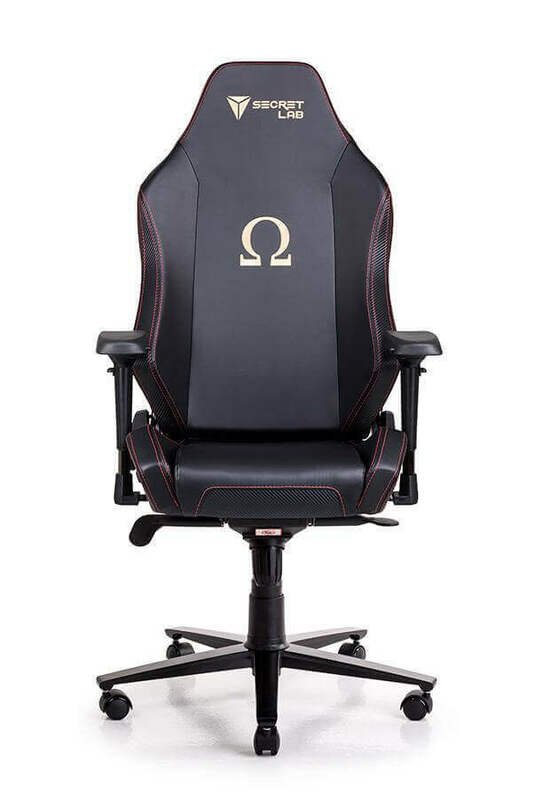 If you are bigger and need a wide seat, or taller and need a high backrest, then you may want to check out a specialty gaming chair for big and tall gamers. We would definitely recommend this chair for office work and gaming. It has a lot of the features that we typically look for in a good long-term use chair. Here’s what we found. Multi-functional features mean we can sit upright, rock back and forth, or recline all the way back for a nap, and who wouldn’t want to do that? All-in-all, these are some pretty impressive features, and we would recommend the Merax high-back computer chair for most gamers looking for affordability and comfort. Here are the things we would have changed about the Merax gaming chair, if we could have made it a perfect racing chair. The complaints on the Merax gaming chair are pretty minor overall. Many chairs in this style don’t offer adjustable armrests, though it’s a feature we would prefer. And the weight capacity is only a con for some individuals. The chair is perfect for teen and young adult gamers, or adults under 200 pounds. Most of the features listed are pretty clear cut, but sometimes you just need a little extra information in order to know whether a game chair purchase is right for you. With that in mind, we’ve compiled this list of frequently asked questions to help you figure out if the Merax gaming chair fits your specific needs. Does the chair come in different colors? Yes, this chair is available in three different color options: black and white, black and red, and our favorite, black and yellow. Each of the dual color styles looks great in a game room or office. Is this chair good for tall people? Yes. Like most racer style chairs, this chair is designed with an extra high backrest. The high backrest is to provide support all the way through the spine. And the Merax gaming chair’s backrest is 33.4 inches high, which should accommodate taller individuals. 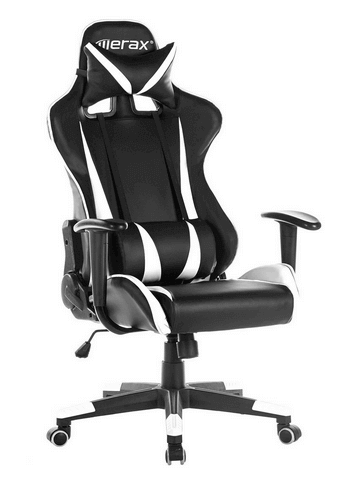 In fact, it’s higher than the backrests on several other racing game chairs we’ve reviewed. Is this chair good for heavy people? The Merax gaming chair should accommodate most gamers up to about 225 pounds. Compared to similar chairs, that’s a slightly smaller weight capacity than usual. So if you’re above 225 pounds, we suggest going with a chair specifically made to provide more room and support. In general, we’d recommend this chair for gamers under 200 pounds to get the most longevity out of it. Not at all! The chair screws together easily. With all self-assembled chairs, though, there can be issues with screws not aligning just so, simply because it’s a new setup to the user. You can account for this by putting all the screws in place and waiting until they’re all in to tighten them fully. You don't need any special tools to assemble this and one person can generally do it alone. The backrest is a bit heavy and kind of tricky to place it on the post, but that shouldn't really be an issue. How far does the backrest recline? The backrest reclines from 90 degrees to 180 degrees. It goes back to a full laying down position at the fullest recline, making it perfect for comfortably resting while taking a break from work or a short nap between gaming sessions. What material covers the chair? The chair and its pillows are covered in PU leather, a synthetic leather that is easy to keep clean and will resist absorbing sweat and body oils. It can be wiped clean with a damp cloth and doesn’t require much upkeep. Is it easy to clean a spill or will it stain? Since the material is PU leather, it is very easy to clean. it won't absorb any liquid and won't get stained by sauces or juice or anything. to clean it most of the time it just needs to be wiped off with a paper towel. If it is something that dried on, then just get some warm soapy water and a cloth and wipe it off. Make sure it is dry with a paper towel, and that is it. So now you know what you get with this racing chair. But is it better than other chairs in its price range? We took a look at a few similar models, another from Merax and one from another company. The Merax Racing Gaming Style High Back PU Leather Metal Frame Swivel Office Chair looks quite similar to this Merax chair. It also comes in three colors, two of which provide different options of black and green, and black and purple. The alternate Merax chair is made with a bit heavier frame and will accommodate gamers up to a maximum weight of 250 pounds, so if you’re uncertain whether the Merax Racing Gaming High-Back Chair Computer Ergonomic Design Computer Chair PU Leather Office Chair will support your weight, then we’d suggest the Merax Racing Gaming Style High Back PU Leather Metal Frame Swivel Office Chair instead. Their other features match up pretty evenly. The BestOffice Office Chair High-back Recliner Office Chair Computer Chair Ergonomic Design Racing Chair has a simpler style at first glance, and some may like that there is not a prominent logo on the chair. This chair also swivels, tilts, and reclines, and holds a weight of up to 250 pounds reliably. However, at a similar price, the BestOffice game chair also provides an attached footrest, which can be a nice feature when you fully recline for a nap, or just to prop up your feet while you game. That being said, BestOffice does not provide the ease of customer support that you get with Merax, a better established brand. We suggest going with a chair from a trusted brand like Merax over the lesser known models. You can count on their customer support, and they publish all of their contact information where you can easily find it online. This chair is on the lower end of the price range for racing style game chairs, and we were really impressed with the features given the cost. The only gamers we wouldn’t recommend this chair to are those who need a wider seat or more support for heavier weights. How about you start saying where a chair is made. Some of us do not like buying Chinese cheap products that break within 1 year. I would rather pay the extra for a chair made outside of China and get better service.